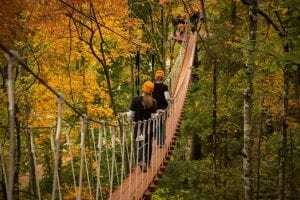 Each fall, millions of vacationers flock to Tennessee’s Great Smoky Mountains to see the area’s gorgeous leaves. If you’re planning an autumn getaway near Gatlinburg, be sure to put a mountain biking expedition on your itinerary! 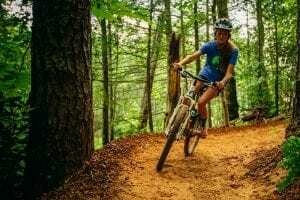 To help you make the most of your next escape, CLIMB Works has put together five reasons the fall months are ideal for mountain biking in the Smokies. Mountain biking is one of our favorite ways to see the stunning autumn leaves in the Smoky Mountains. 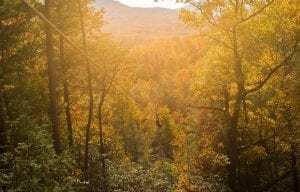 Located across from the Great Smoky Mountains National Park, the “El Regis” trail at CLIMB Works weaves through a lovely forest that comes alive with technicolor foliage during the fall. Bikers will see virtually every shade of yellow, red, and orange as they make their way through the trail at their own pace. Mountain biking is not allowed within the Great Smoky Mountains National Park, which makes CLIMB Works the only place visitors can bike in the area. The fall weather is perfect for mountain biking in the Smokies! With average highs in the low 70s in October and the 60s in November, the temperature is pleasantly cool, without being too cold. Rather than sweating in the sweltering summer sun, bikers can enjoy the crisp autumn air as they conquer El Regis. October also boasts the least precipitation of any month, so you don’t have to worry about your mountain biking adventure getting rained out. The fall weather isn’t just good for bikers, it’s good for our trail as well! The cooler temperatures and dry air help to keep the dirt on the trail nice and tacky, meaning that the soil offers better traction. This tacky dirt allows tires to firmly grip the ground, which makes it easier for bikers to reach top speeds without losing control. When you take a fall mountain biking trip to the Smoky Mountains, you can take advantage of all the autumn fun going on in Gatlinburg! Throughout the fall months, Gatlinburg hosts its annual Smoky Mountain Harvest Festival, which brings beautiful harvest-themed decorations to the downtown area. Other highlights of fall in Gatlinburg include the Craftsmen’s Fair in October, Halloween celebrations, and a Chili Cookoff in November. In addition to our stellar mountain biking in the Smokies, CLIMB Works also offers phenomenal ziplining. Our Mountaintop Zipline Tour and Treetop Zipline Tour both feature breathtaking views of the fall colors in the mountains. We even offer special combo deals, so guests can enjoy a full day of mountain biking and ziplining. To learn more about saving money at CLIMB Works, check out our Adventure Packages!